Evidence abounds in the livelihoods literature that rural households have a diversified portfolio of income sources, and that the share of income from non-farm sources is increasing overtime. 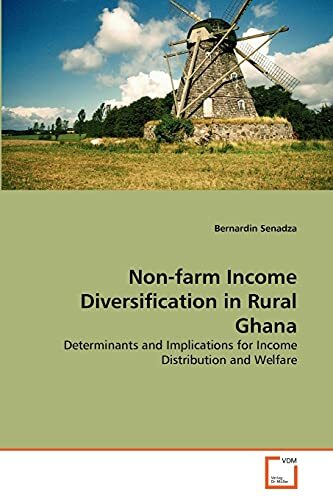 Using data from national level household survey, this study investigates the determinants of non-farm income diversification among rural households in Ghana, as well as its income distribution and welfare implications. The findings of the study provide additional insight into diversification behaviors of rural households across the developing world, and highlight the need to promote and enhance the capacities of rural households, especially poorer households, to participate effectively in non-farm activities as a complement to agriculture to help reduce rural poverty. This book therefore is a useful reference material for policy makers, researchers and students of development economics. Bernardin Senadza is a lecturer in Economics at the University of Ghana. He holds a PhD in Economics from the University of Ghana. His areas of research interest include rural household livelihood strategies, poverty and inequality, international trade and education.